With five players left at the 2006 World Series of Poker (WSOP), the following hand came up between top pro Allen Cunningham and eventual winner Jamie Gold (Gold is now the reigning World Champion of poker). At the time, Gold was the chip leader with $44.7 million in chips and Cunningham was in third place with $13.7 million in chips. With the blinds at $150,000-$300,000 Cunningham opened — as the first person to act — for $900,000 with Ac-10c, Gold called on the button with 8s-8d, and Paul Wasicka called $600,000 more in the big blind with Js-10h. The flop came down Ah-8c-2s. What a dream flop for Gold, and conversely, a nightmare flop for Cunningham. Wasicka checked, Cunningham bet $1 million, Gold studied for a second and called, and Wasicka folded. By just calling on the flop Gold was attempting to trap Cunningham, and that is an advanced play that I would rate as a good one. On the other hand, I wouldn’t mind seeing Gold make a raise here, of about $1.5 million or so. This would force Cunningham to call if he had an ace, and perhaps move all-in if he had A-K, A-Q, A-8 or A-2. Still, all in all, I like the call more. The perfect play here depends on a successful read of your opponent. I would hope that if I were in Gold’s shoes, that I would sense strength (in which case I would raise it up) or weakness (in which case I would just call). The next card off was the 6d, Cunningham checked, and now Gold checked quickly. First off, I hate Gold’s check here. Why not bet something small like $1 or $2 million? 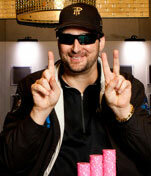 This way Cunningham has to call you if he has an ace, or he may get crazy and move all-in on you. Also, by betting small in this situation you give your opponent a chance to raise you, whether he has a strong hand or not. Secondly, I hate the fact that Gold checked so quickly behind Cunningham. Usually when someone checks that quickly behind you they’re trying to say, “I have nothing at all, thus I’m checking quickly behind you.” To a top pro like Cunningham, that quick check looks like strength. Why else would someone check that quickly when there are no draws on board? The last card was the 2h (Ah-8c-2s-6d-2h), Cunningham bet $2 million, and within four seconds Gold said, “I raise.” Within six more seconds Gold said, “I’m all-in,” and stood up. Then within 10 more seconds he told Cunningham, “Gotcha.” To which Cunningham instantly replied, “Yep, I guess you do.” Then Gold instantly said, “You know I know you didn’t have it.” Then Cunningham said, “Nice hand,” and folded immediately. How did Cunningham fold his strong hand so quickly? Because Gold made a litany of mistakes on the last round of betting, not too mention the quick check on the turn. First, he announced raise way too quickly. Second, he raised it up way too much. Third, he stood up. Fourth, he told Cunningham that he had him beat. Fifth, he tried the super amateur move of saying that he didn’t think that Cunningham had it, as if to say, “If you do have it then you have me beat.” Give Cunningham maximum credit here, he saw all of the signs, picked up on all of Gold’s tells, and folded his strong hand instantly. Here is why Gold was so readable to Cunningham. First, do not raise it up too quickly — especially on the end — as it is a sign of strength. Second, why go for all of Cunningham’s chips on the end? Why not raise it up $2 or $3 million? This way you’ll have a better call rate. Third, when you move all-in and stand up you’re giving away free information to a sharp observer. In this case, Gold looked pretty darn excited — a sure sign of strength — to me (and Cunningham) when he stood up. Fourth, above all else, do not tell a pro the truth about a hand. It is easy for us top pros to read you when you open your mouth at all, especially when you’re telling the truth. Something just resonates with us, and were like, “He’s not lying, that much I know.” Finally, and again, do not talk at all to a top pro whether you’re bluffing or have the goods. Especially when you’re making a statement like, “You know I know you didn’t have it.” Amateurs issue challenges like this when they’re super strong. On the other side of the coin, Cunningham played this hand flawlessly: from the bet on the flop, the check on the turn, the value bet on the river, and the quick fold on the end. It must be said that he lost close to the minimum with this hand in this scenario. For the record, Gold did play great poker, and many of his moves (like moving all-in quickly, standing up when he moved all-in, telling people he had them beat, and chit chatting with his opponents during hands) worked flawlessly against the other amateur players, just not so well against Cunningham.